WHISPER WALL Sound Absorbing Noise Barrier Wall reduces reflected noise from highway, railway and airport noise sources. 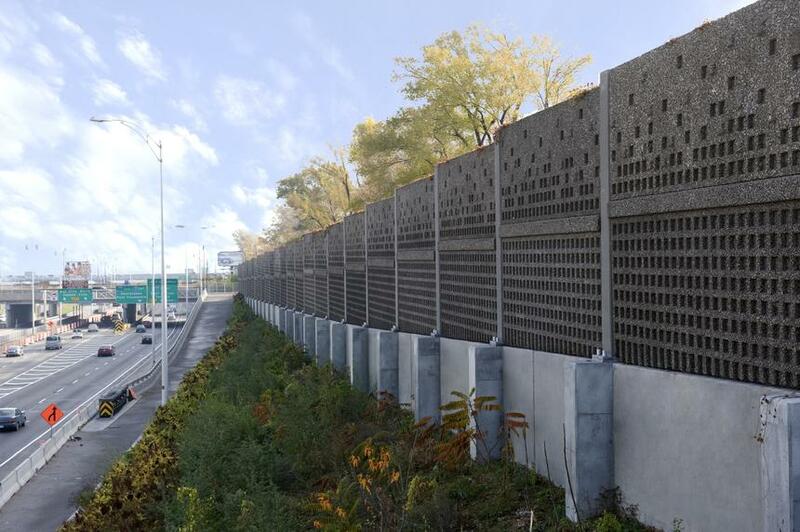 Noise Barrier walls reduce noise levels for people living next to highways, either by absorbing the noise energy or by reflecting the noise energy. Both methods work, however, sound absorption is more efficient and less likely to produce unexpected results. Sound absorbing precast concrete noise barrier walls allow sound waves to enter the wall, as the sound waves travel through the sound absorbing mixture they are forced to change direction and follow a longer path. Every change in direction decreases the sound waves energy. After the sound waves completes its journey through the wall, little, if any sound energy remains to reenter the environment. In comparison, reflective noise walls abate noise by redirecting sound waves into the atmosphere. This is risky because reflected sound waves traveling through the atmosphere and can bend upward or downward depending upon existing meteorological conditions. Consequently, as atmospheric conditions change , the accuracy to predict how reflected sound waves travel decreases. This explains why some residents living across from a reflective noise barrier may experience new sounds and / or increased noise levels. Sound Absorbing Noise Barriers are an effective way to reduce noise levels for people living behind a noise wall and for people living opposite the noise barrier. Environmentally engineered,WHISPER WALL absorbs noise using a highway generated waste product, RUBBER VEHICLE TIRES. Rubber tires are recycled and processed into small chips, the rubber chips are then blended with natural sound absorbing aggregate and cement to produce our patented sound absorbing mixture.